Welcome to the Sacco and Vanzetti Commemoration Society Webpage! We will be out on the streets of Boston every year around August 23 and besides marching and demonstrating we hope to establish the foundation for a monument to Sacco and Vanzetti in the North End of Boston. 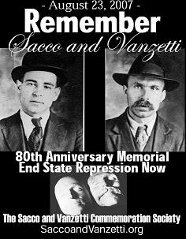 The Sacco and Vanzetti Commemoration Society exists to preserve the memory of Sacco and Vanzetti's struggle to radically change society. We want to educate our neighbors about Massachusetts' radical history, and draw connections between the struggles of Sacco and Vanzetti and similar struggles today. We stand against the death penalty and political persecution as well as the persecution and scapegoating of immigrants.